Ford's stock price keeps falling, pushing its dividend yield higher. But if it's a big check you're looking for, here are three other names to write on your high-yield list. Shares of auto giant Ford Motor Company (NYSE:F) have generally moved lower for multiple years now, as the U.S. auto market peaked and has now entered into a bit of a slump that investors are convinced is going to take a big bite out of the company's earnings. And while that's already happening, with Ford's earnings down almost 45% last quarter, no less than the company's CFO has said that the current dividend is secure through nearly any economic environment. And considering that the Ford family still maintains a controlling share of the company -- and many of them count on their stake for income -- it's likely that things would have to get really bad before Ford would seriously entertain a payout cut. But there are plenty of stocks that pay even higher yields that investors should at least entertain buying. We asked three Motley Fool contributors to offer up a compelling dividend stock that's paying more than Ford, and they came up with a surprisingly diverse list: Pattern Energy Group (NASDAQ:PEGI), L Brands (NYSE:LB), and Turkcell Iletisim Hizmetleri A.S. (ADR) (NYSE:TKC). These three companies yield 8.6%, 9.1%, and 8.1% at recent prices, and there's a strong argument that those payouts are as secure as Ford's. Keep reading to see how they might fit in your portfolio of income stocks. Jason Hall (Pattern Energy Group): With almost 15% of Pattern Energy Group's shares sold short at last count, a substantial number of investors are betting that the independent renewable-energy company won't be able to continue paying its hefty dividend, which yields 8.6% at recent prices. In short, the bear thesis is that rising interest rates and changes to the U.S. tax code will hurt the company's access to capital, forcing it to cut the payout to retain cash to pay its debts while also killing its ability to grow. But I think the combination of its experienced management, which has developed renewable-energy assets for decades and across multiple interest-rate and economic cycles and different tax-code environments, and its exposure to a powerful international growth trend, is worth far more in upside than the downside risks of higher rates and changes to tax policy affecting its access to capital. Furthermore, I think its cash flows -- hence the dividend -- are probably more secure than they seem. The company generated $123.5 million in operating cash flows in the first half of 2018, and those cash flows are secured by long-term contracts averaging well over a decade for the power produced from its renewable energy-producing asset. It's also spending a tremendous amount of capital -- $296.4 million over the same period -- to grow larger, and mainly using debt and new shares to fund it. If you're not comfortable with a company using a substantial amount of leverage to expand while also paying a dividend, Pattern isn't right for you. But if you're willing to take the risk that its talented management team will continue to execute well -- as I am -- and that the dividend will be supported for the long term, then Pattern Energy is worth a look. Jeremy Bowman (L Brands): Would you believe that the parent of Victoria's Secret offers a better dividend yield than almost any other stock on the market today? L Brands, which also owns Bath & Body Works, currently pays a whopping 9.1% yield, much better than even Ford. 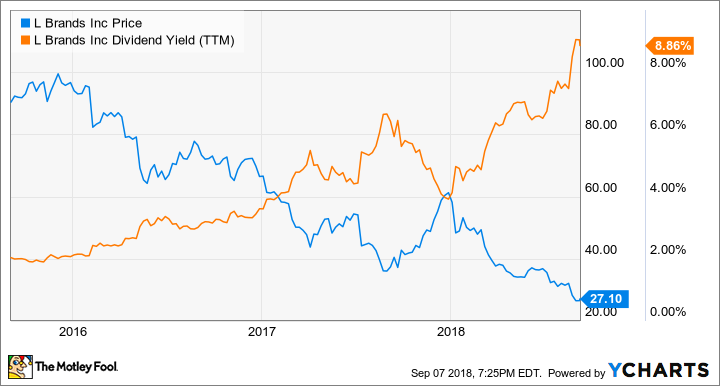 The mall staple may appear to some as a "yield trap" to some, as the stock has plunged this year amid disappointing earnings reports and weakness in the core lingerie chain. Shares are down 57% so far this year, after the company cut its guidance twice this year, and sees profits for the current quarter at near breakeven, the first time it's made such a forecast in more than a decade. Comparable sales increased 3% in the most recent quarter, but that was largely driven by strength in the Bath & Body Works segment, which rose 10%. Comps fell 1% at Victoria's Secret and by mid-single-digits at PINK, Victoria's Secret's college-age-focused sister chain. PINK CEO Denise Landman is retiring at the end of the year, perhaps because of the brand's struggles. Victoria's Secret, meanwhile, has been challenged by the trend toward bralettes, which are cheaper than Victoria's Secret's form-fitting bras, and American Eagle's Aerie is also stealing market share. That competition has pressured margin, and earnings per share have fallen from $0.81 to $0.52 through the first two quarters of the year. However, the Victoria's Secret brand remains solid, with nearly universal recognition and leading mindshare in lingerie. Sales are still growing, and the company should eventually overcome the current headwinds. If it does, investors who get in now will be rewarded, with a stock price that's likely to rise and a 9% dividend. 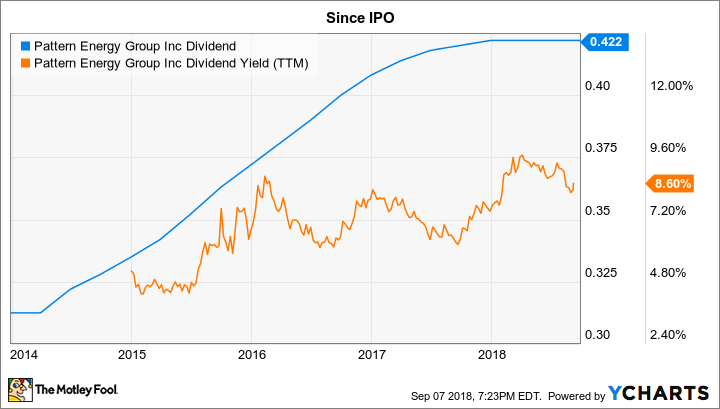 Rich Smith (Turkcell): Investors hunting for big dividend payouts have historically had a lot of luck finding dividend behemoths in the telecom sector, where reliable cash flows offset the risk of big debt obligations to permit generous payouts. Here in the U.S., Verizon, with a 4.3% payout, and AT&T, paying 6.3%, are both obvious choices in this sector. But I know of one other telecom dividend payer whose dividend is looking even more generous: Turkcell Iletisim Hizmetleri. Known simply as "Turkcell" to its friends, this is the largest telecommunications company in Turkey, a country that's entered into troubled times under the administration of strongman President Recep Tayyip Erdogan. Thanks to devaluation of the Turkish lira and mounting fears surrounding Turkish companies' abilities to repay their debts, Turkcell stock has underperformed the S&P 500 over the past year. That's despite the fact that Turkcell carries a much lighter debt load than many other telecoms bear. Importantly, the lower its stock price falls, the bigger Turkcell's dividend yield looks in comparison. Currently, Turkcell yields an impressive 8.1% , nearly two percentage points more than AT&T pays its shareholders. The result is a payout ratio in excess of 100% at Turkcell, which would ordinarily be a worrying statistic. But because Turkcell generates so much more free cash flow than its income statement reflects -- $619 million in FCF, versus reported net income of just $377 million -- it looks to me that Turkcell has plenty of cash available to keep on paying you better than Ford.